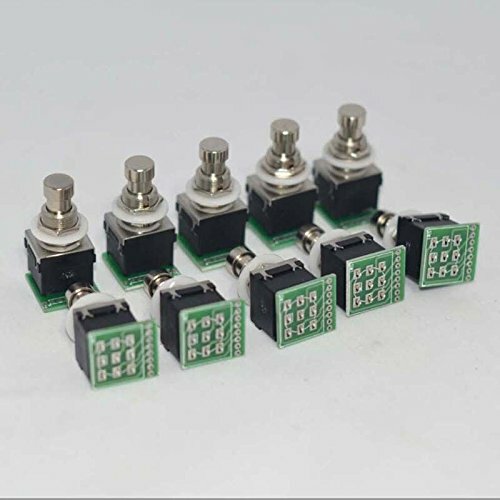 3PDT 9-pin Guitar Effects Pedal Stomp Switch （Our factory production and sales） Package inlcuded: 10pcs 3PDT 9-Pin Guitar Effects Stomp Foot Switches WITH PCB Description： 1.Black body，3PDT TRUE BYPASS SWITCH WITH PCB 2.The product is used for：Guitar effect pedal switch or pedal boxes switch. 3.For ,BBE,VHT,Electro-Harmonix ect effects pedals. 4.The third pole can be wired to control an LED status light or other custom function. There are a total of nine lugs on each switch,three per pole. AT least 7/8" depth and 1/2"-diameter mounting hole are required.the threaded portion is 7/16" tall. Hex nuts,lock washer,flat washer inculded.